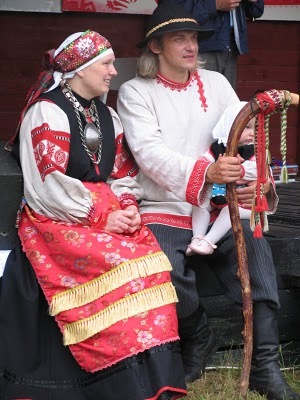 Today I will talk about the costume and embroidery of one of the Baltic Finnic Peoples, the Seto. 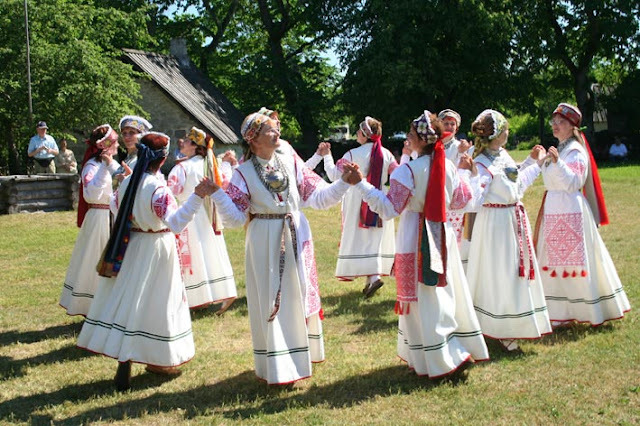 They are sometimes considered to be a rather divergent Estonian group, but they consider themselves and their language to be distinct. 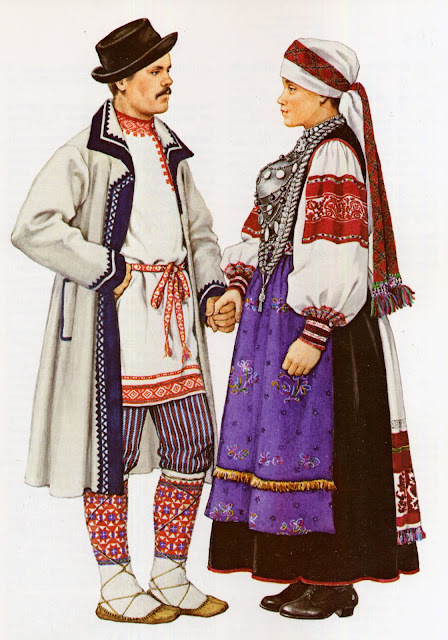 In Estonian and in Russian they are called Setu. 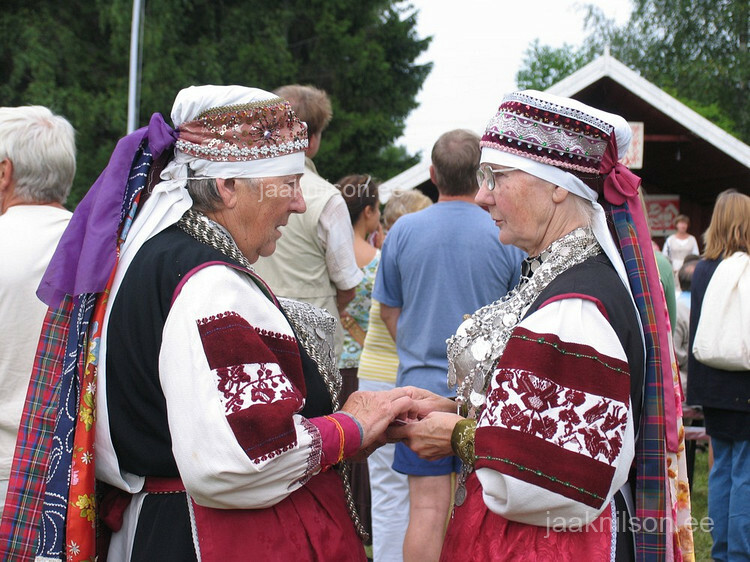 They call their homeland Setomaa, and it is currently divided between Russia and Estonia. They, like so many indigenous peoples, are a minority in their own homeland, being outnumbered by ethnic Russians on both sides of the border. There are maybe 10,000 or so unassimilated Seto today. 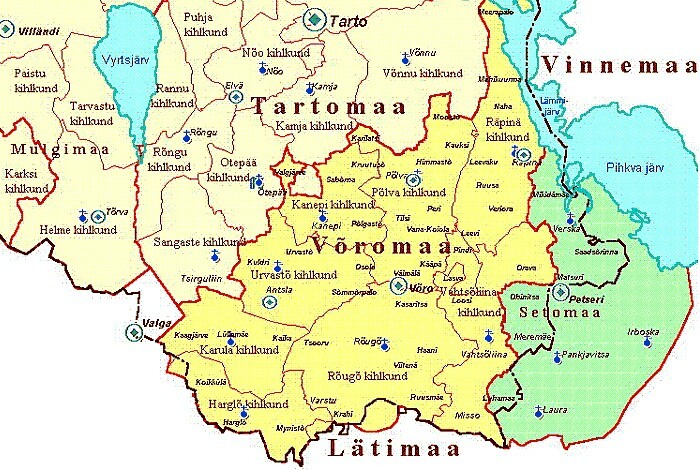 Here is a map of Setomaa, in green. 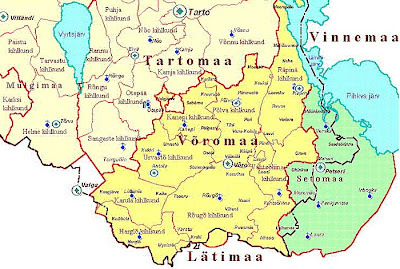 The Estonian provinces of Voromaa and Tartomaa are visible to the left, and Vinnemaa, which means Russia in Estonian is to the right. The dark line is the border. 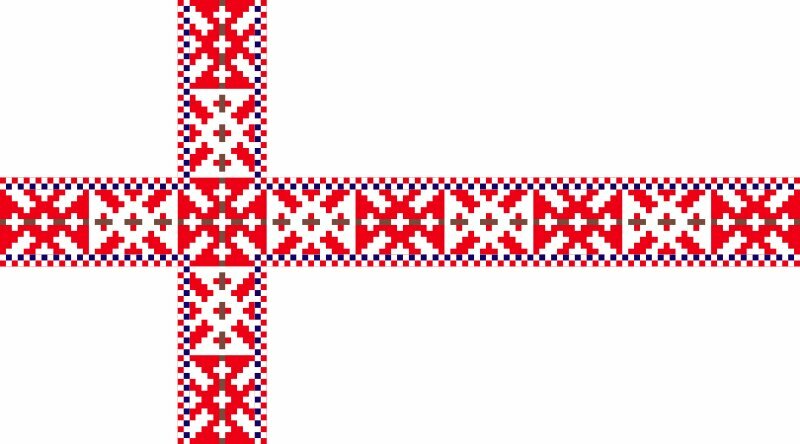 Here is the Seto flag. 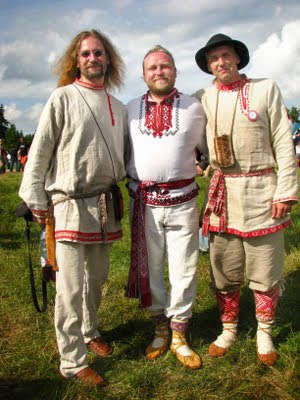 The photo at the top of the article shows three people in traditional costume. 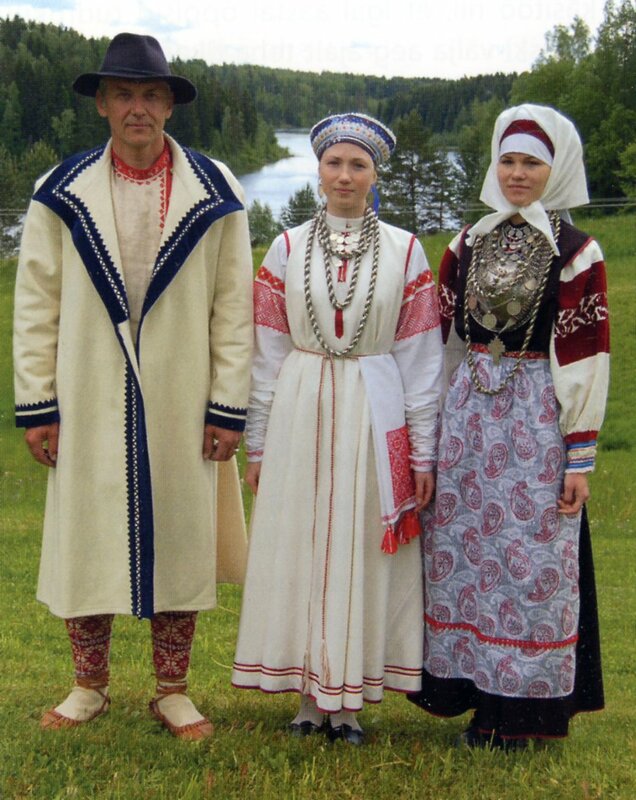 the woman in the middle is wearing the old costume which dates to the first half of the 19th cent, and the woman on the right is wearing the 'new costume', which was worn from the second half of the 19th cent. Both are commonly used now for performances and special occasions. 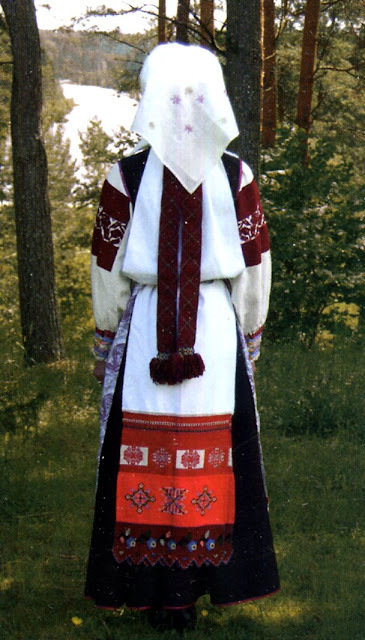 The chemise [ pikki käüstega hamõ ] of the old costume has a very archaic Uralic style cut, somewhat reminiscent of that of the northern Udmurt. 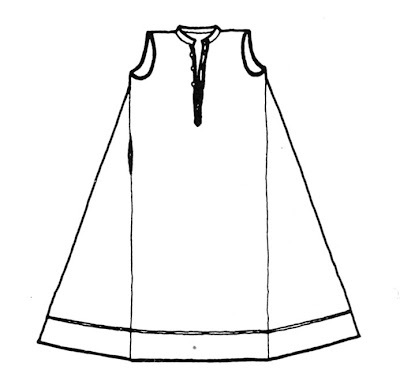 The sleeves are very long, and are gathered up on the forearms. 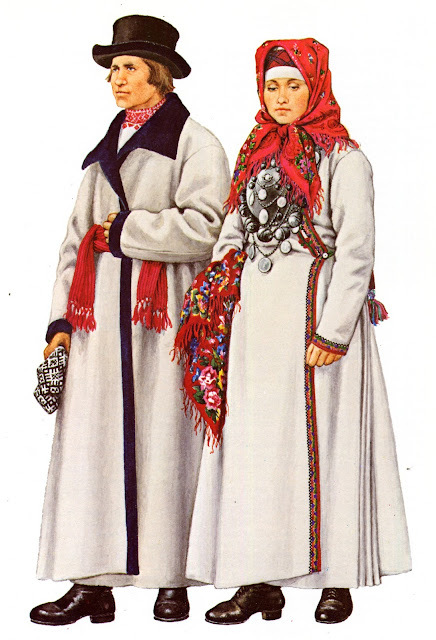 When working, the women would put their arms through the openings at the elbows, and tie the ends of the sleeves in back. 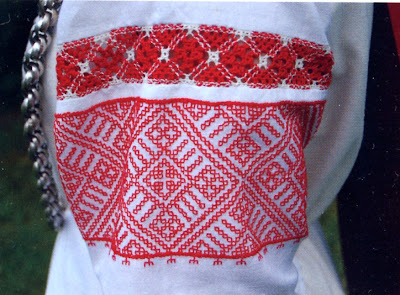 Red stripes are woven into the linen across the shoulders, then a piece of red and white bobbin lace would be inserted at the shoulder seam, and there is red embroidery at the upper end of the outer sleeve piece. 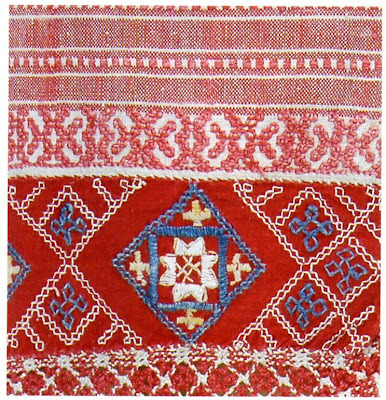 A narrow ornament would also be embroidered at the cuff. 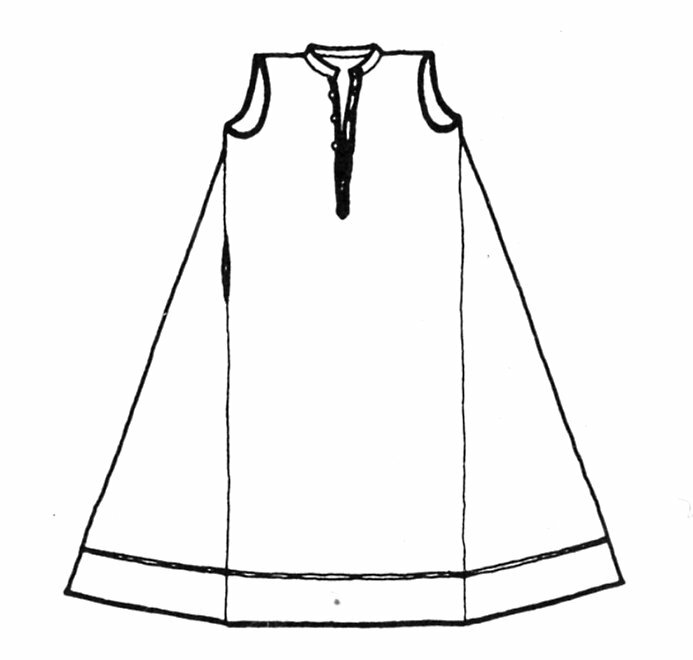 You can see a seam across the middle of the garment, the upper part is made of finer linen, and the lower part, which does not show, of coarser. 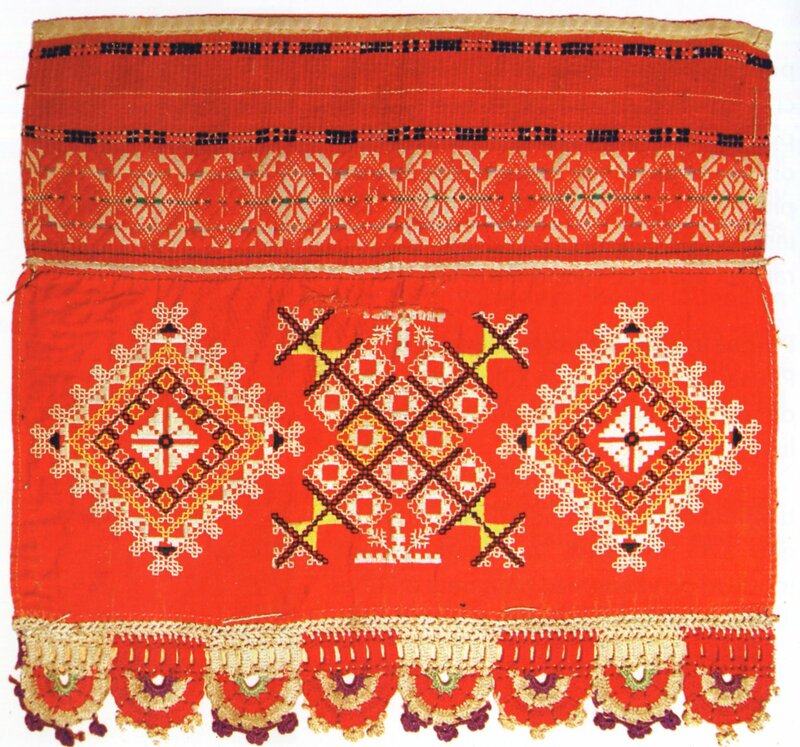 In this museum piece, the embroidery looks like darning stitch. For modern pieces they use prepared linen which does not have the red stripes for the shoulders. 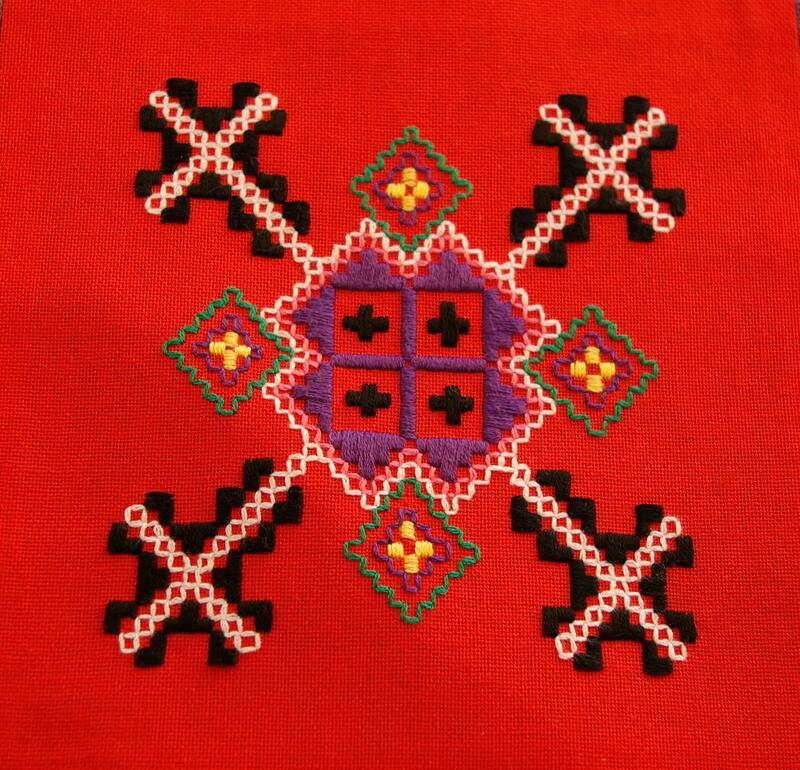 They also tend to use diagonal Holbein stitch for the embroidery. 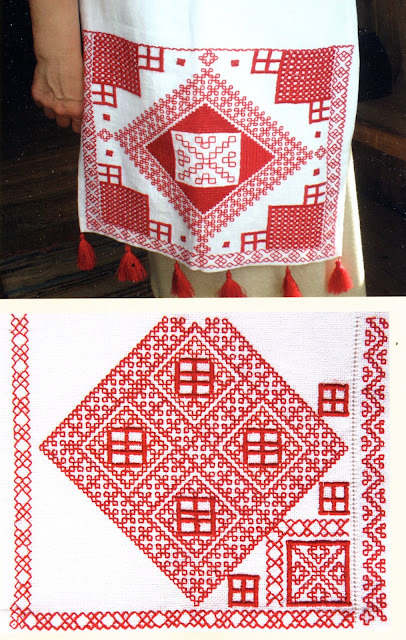 We have seen this type of embroidery in Karelia, Ingria and northwest Russia, it seems to be spread all over the region. A long white garment is worn over the chemise. 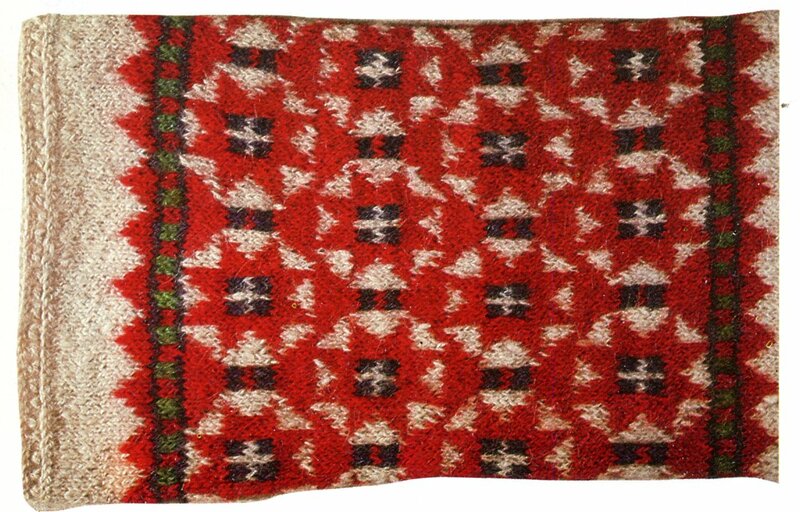 This had a linen warp and woolen weft. It is called Rüüd, and also has long narrow sleeves which are never used, but which hang down in back and are tucked under the sash. It buttons to the waist, and hangs to the ankles. In modern pieces a couple of ribbons are usually sewn on above the hem. A narrow inkle-woven sash with typical designs is wrapped around the waist and holds the outfit together. 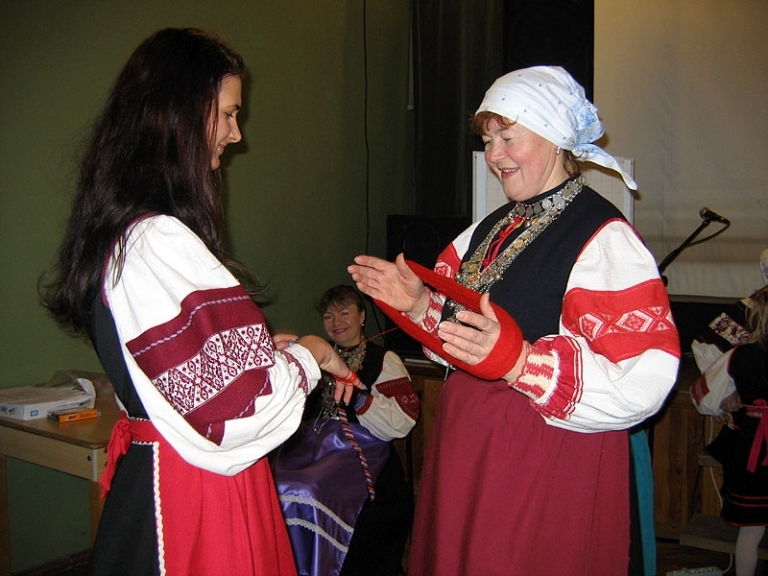 Hanging on the sash is a garment which is unique to the Uralic peoples, the hip apron, Puusapõll. 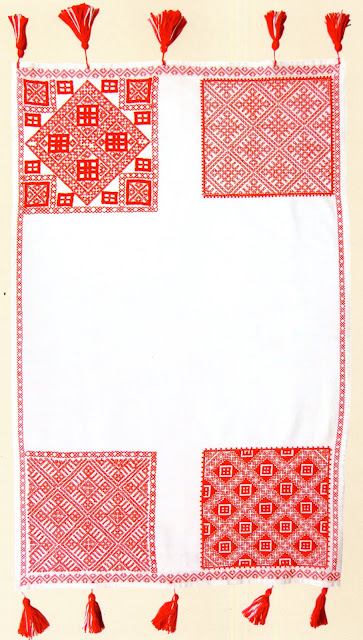 The Seto version is rectangular and has four different designs embroidered on it. Since the garment is folded when wearing it, only one of the four designs is visible at a time. This makes it possible to show off different designs at different times. 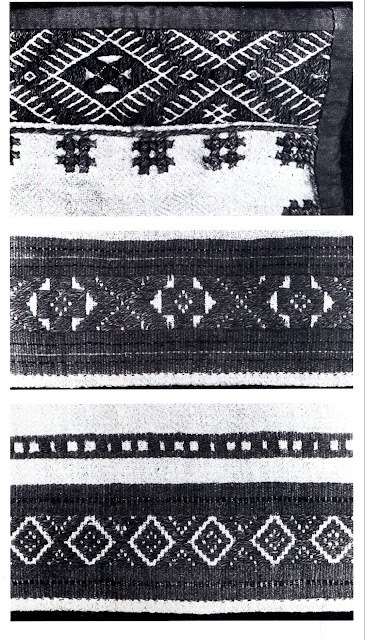 The embroidery is executed in a combination of Holbein stitch, counted satin stitch and darning stitch, with possibly some cross stitch on the borders of the designs. Obviously many designs are possible within this tradition. I have no information as to how or why this costume took over. This was still used into the 20th cent. and is still used today for special occasions. The cut of the new chemise resembles one which is common in northern Russian costume. 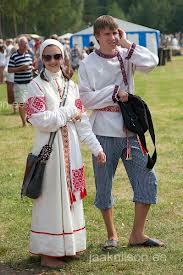 The overgarment is now made of black or dark blue bought cloth and is generally called sukman. 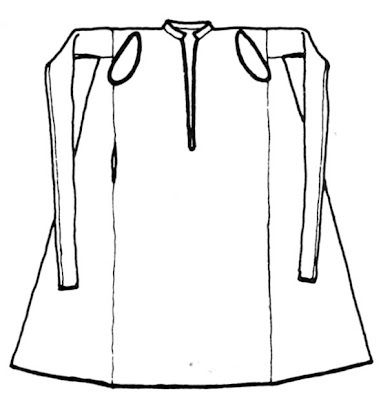 The cut is similar to the old one, but the fake sleeves have disappeared. It is belted with the same kind of sash as the old one. 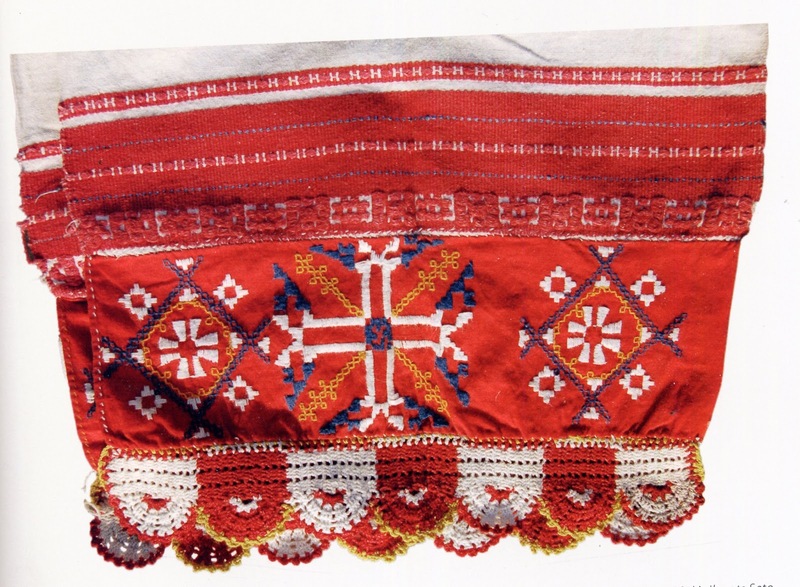 The upper sleeve of the chemise has a woven ornament, with two wide stripes in red and a design woven in pick up in between.The older designs are geometric, but the more recent ones tend to be floral in nature. Another change is that the old red was made from bedstraw root, but when artificial dyes became available, the reds used gradually became darker. 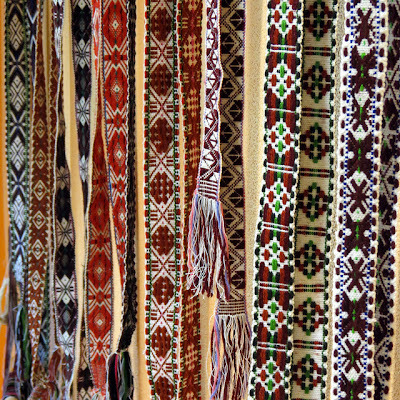 There is a tradition which says that no two chemises should have the exact same design, so there is a great variety of designs found. 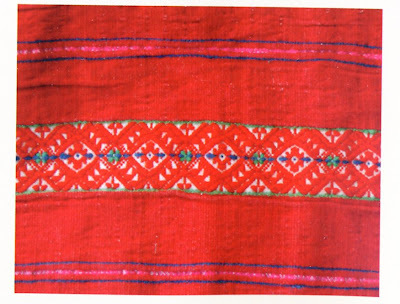 The edge of the sleeve is also woven in red, and the cuffs are usually of bought cloth. 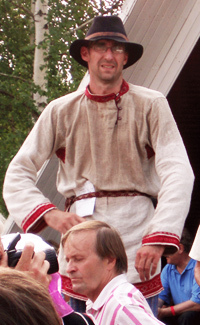 The hip apron is not worn with this costume, and a regular apron has replaced it. 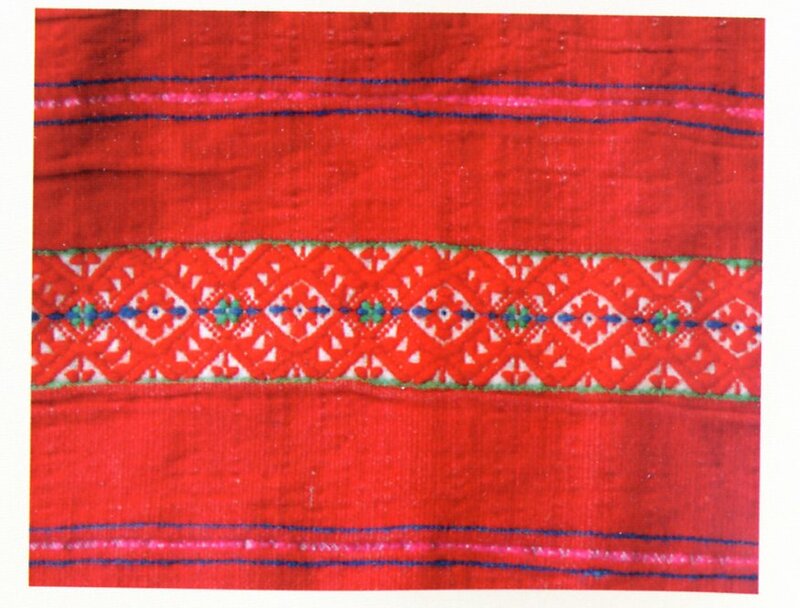 It is usually of a plain color, but often is made of silky material, and sometimes of a printed design. 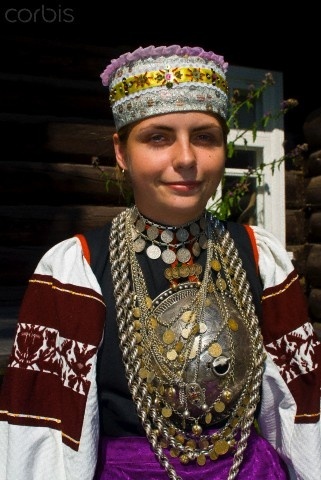 The girl's headdress for both costumes is crown shaped and slightly flared, resembling others worn in the Baltic region. 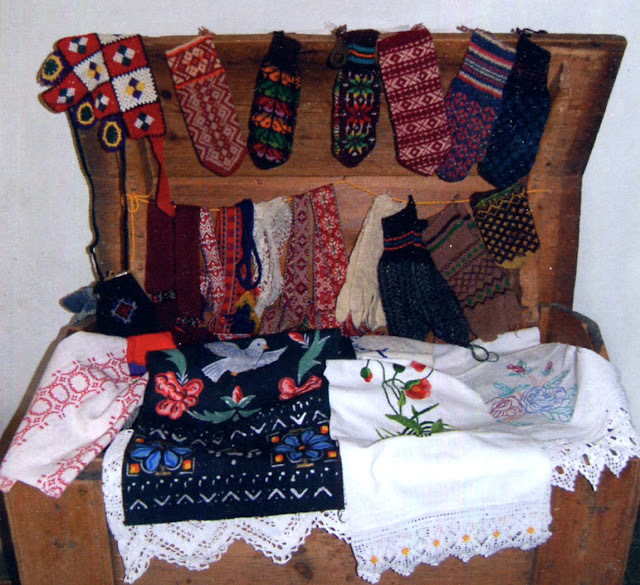 It is tied in back with a wide ribbon and is decorated in a very colorful way. It leaves the hair uncovered. 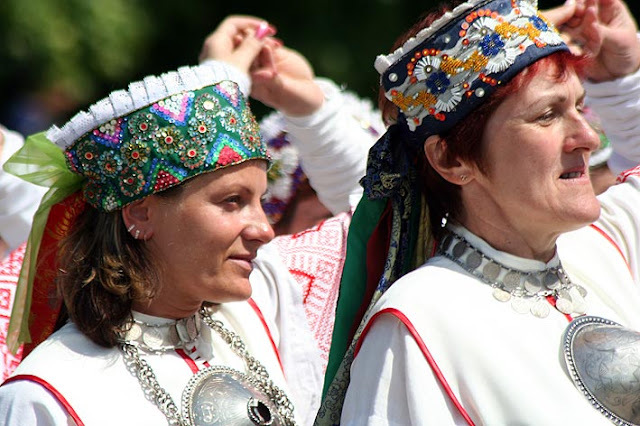 Married women braid their hair into two braids which are arranged around the top of the head. 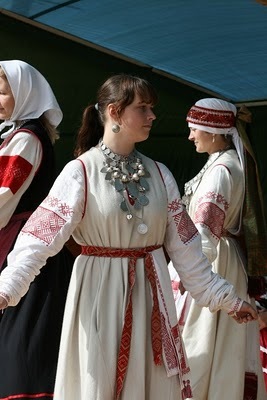 If a woman does not have enough hair to make a complete crown, braids of tow are added. 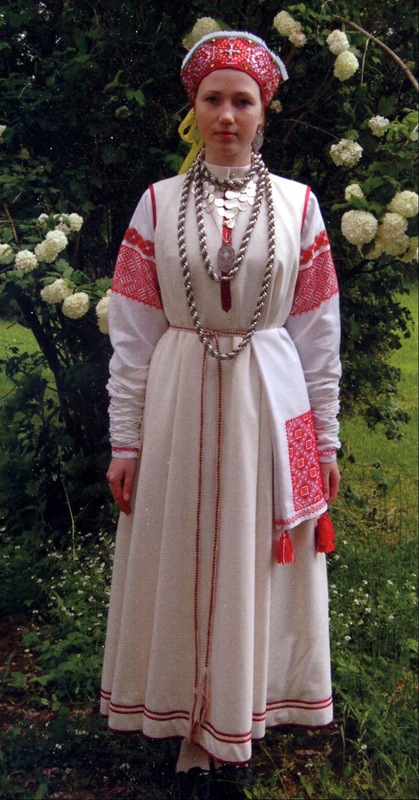 A very long length of linen is wrapped around the head twice, covering the hair and then hangs down the back almost to the hem of the dress. 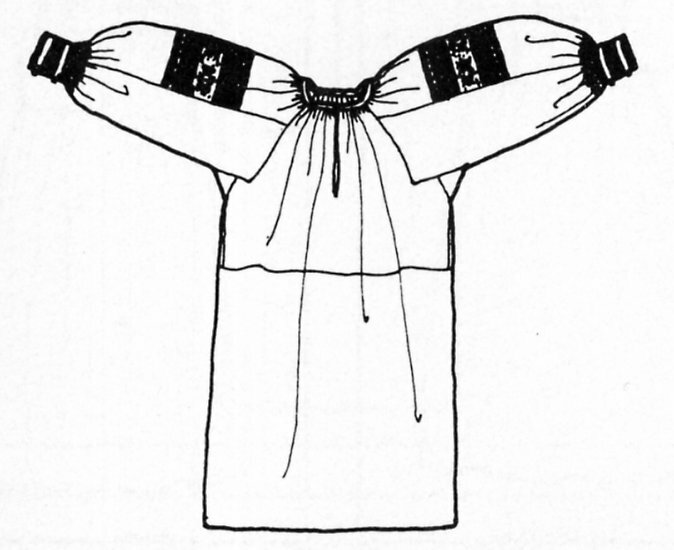 It is held in place by a finger woven sash, and also by the sash tied around the waist. 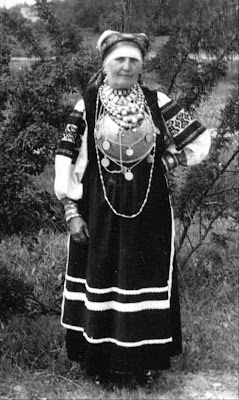 This headdress is also worn with both costumes. The ends of this headdress have red woven ornament and often embroidery as well. 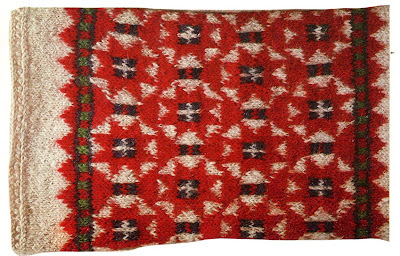 Past this is a solid red woven area with colorful embroidery of a geometric nature or woven design, or both. The very edge is trimmed with bobbin lace, or in some newer examples, crochet lace. This piece has some of the most unique embroidery of the Seto people. 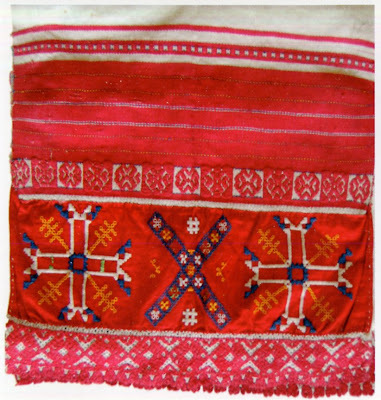 Sometimes a plain or embroidered kerchief is tied over this headdress. 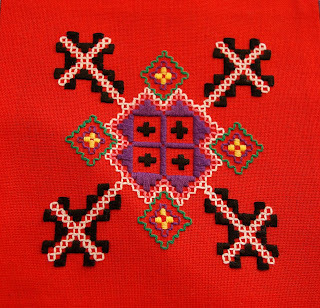 This type of embroidery is now being used on other decorative articles as well. 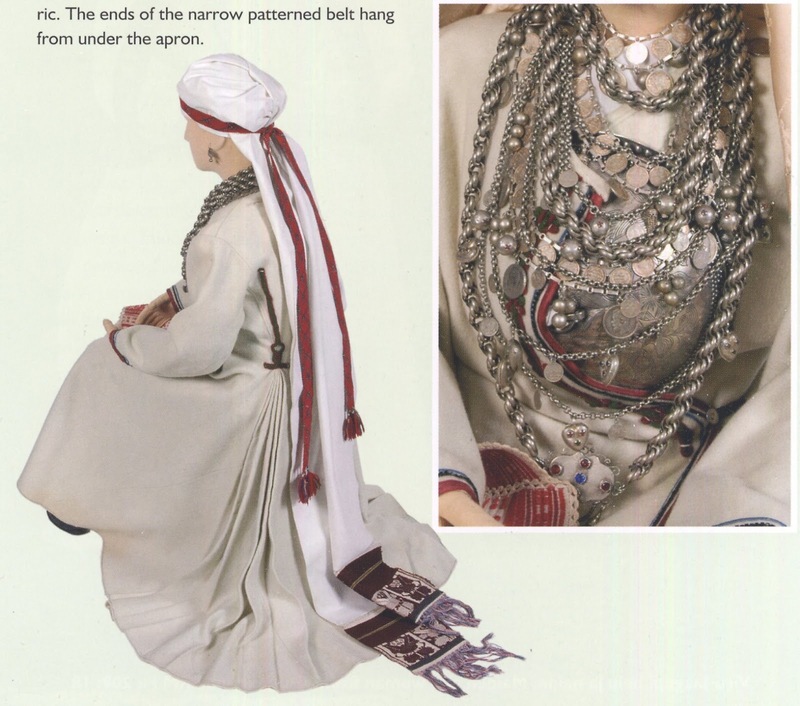 The complex of jewelry which is worn with this costume is truly amazing. First is a circular silver brooch, similar to that worn in many places in the Baltics and Scandinavia, but MUCH larger. 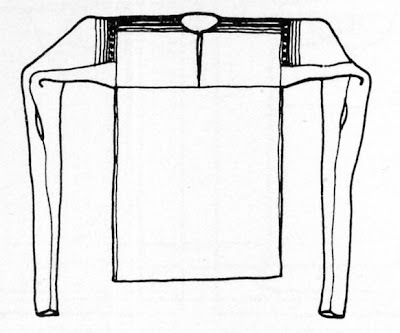 This actually serves to hold the front opening of the garments closed. This brooch has been getting larger for a long time, apparantly, the first image shows an example from the early 19th century and how it actually pins. The second and third images show successively newer ones. You can see that they are getting progressively larger. 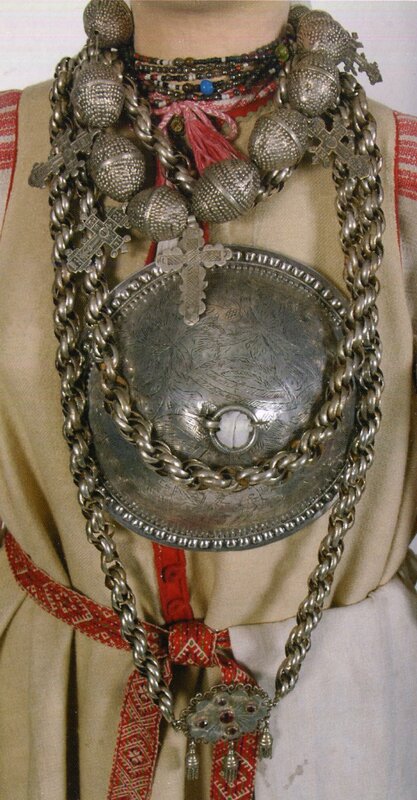 There is a short silver chain with coins, a longer silver chain with hollow silver beads, and a long chain of twisted silver links which is usually looped around three times. Others may be added. 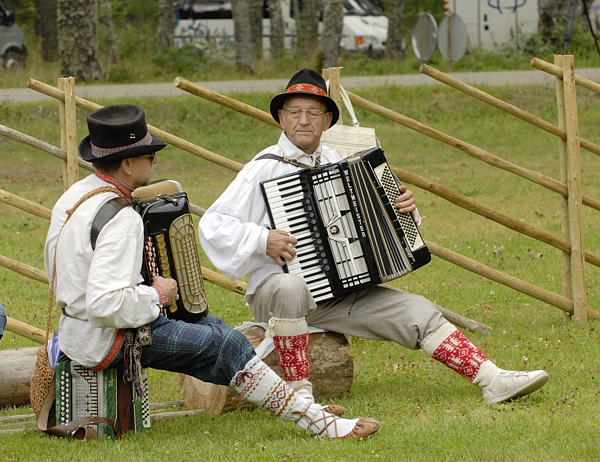 The entire ensemble often weighs 2 kg, or 4-5 pounds. Note also the wool overcoat and woven ornament on the end of the head cloth in this photo. 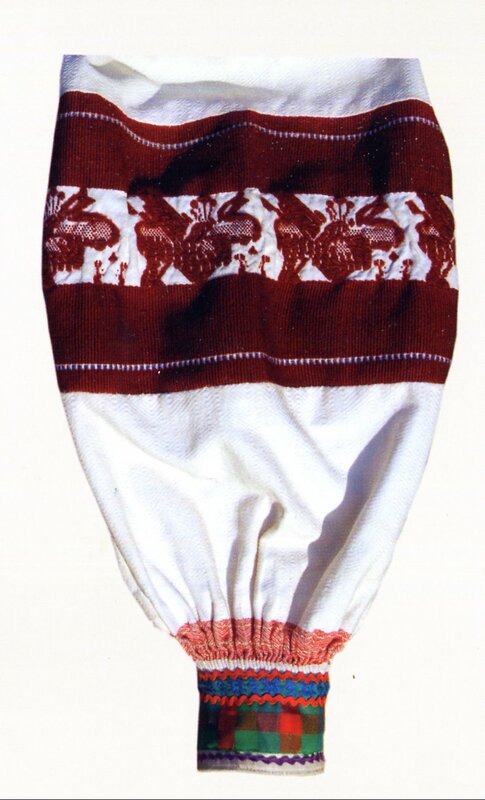 The costume is completed with white knitted 'tube' socks, and either shoes woven of birch bark, moccasins, shoes or half boots, see the various images in this article. 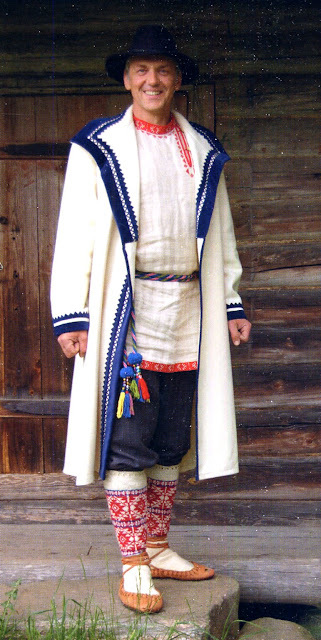 The man's costume consists of a linen shirt with a slit opening left of the neck, linen pants striped in blue, white, and sometimes red, sash similar to that of the women or twisted like a cord, patterned knee length 'tube' stockings, moccasins or boots, and a knee-length woolen jacket. 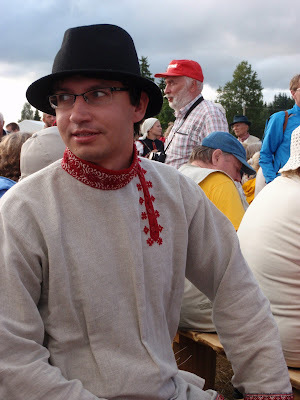 The shirt has a short stand-up collar with red embroidery, often of darning stitch. 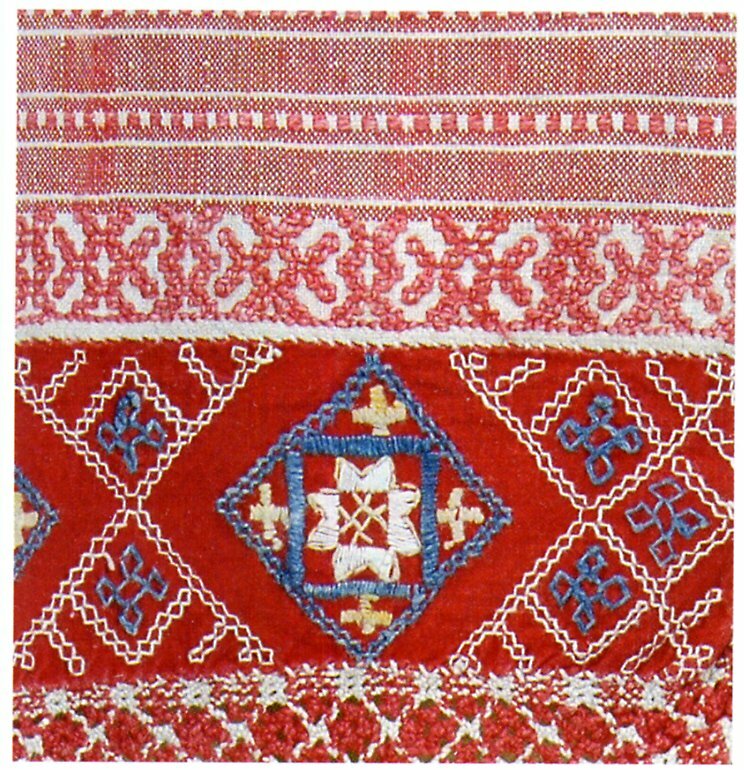 There are small motifs embroidered on the shirt just below the collar and around the opening slit. 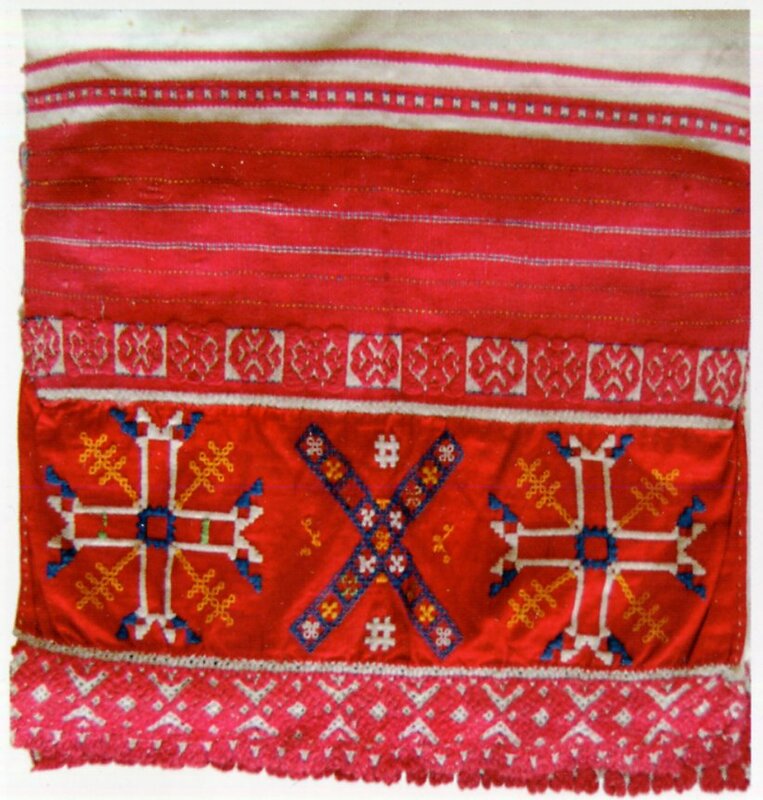 Similar woven or embroidered designs are found on the sleeve ends, the hem of the shirt, and for some reason, on the side panels just beneath the sleeves. Here we have closeups of collar, cuff and hem of an old shirt, from top to bottom. 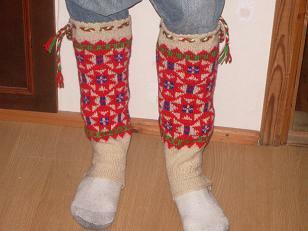 A couple of examples of the designs knit into the socks. As in other parts of the Baltic region, knit mittens are also worn here. 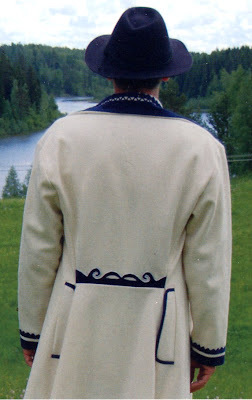 The man's jacket is decorated with applique. The man in the center is not Seto, possibly Mari. In Winter, both men and women wear long full gray overcoats. Thank you for reading, I hope that you have found this interesting and informative. Some of the Seto embroidery would make a beautiful addition to any home. A few more images to close. 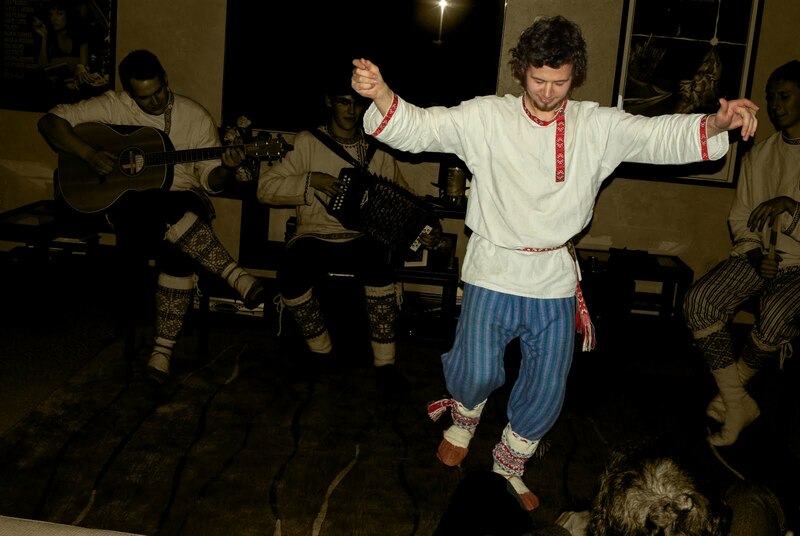 Here is a video documentary about traditional Seto Singing. This was sent to me by one of my readers who is familiar with this region. just found this great blog while searching for provencale folk costumes. you are doing a very good job here! i´m sure i visit you every time i need some beautiful inspiration. Ah! 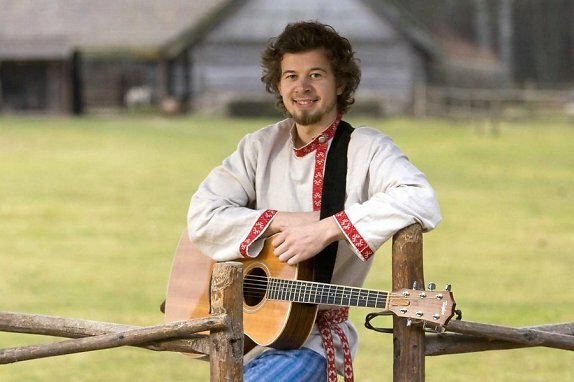 Setomaa! Thank you Roman, this brings me such warm memories! 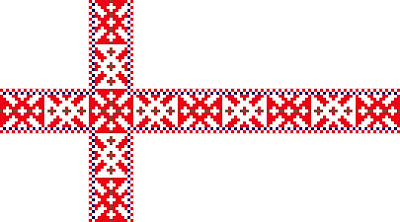 I did not visit Värska for Jüripäev - St Georges day - this year, but I have been there many times. The 22d picture from top: The lady to the left is Veera, a master craftswoman and singer of ancient Seto "leelo" songs. 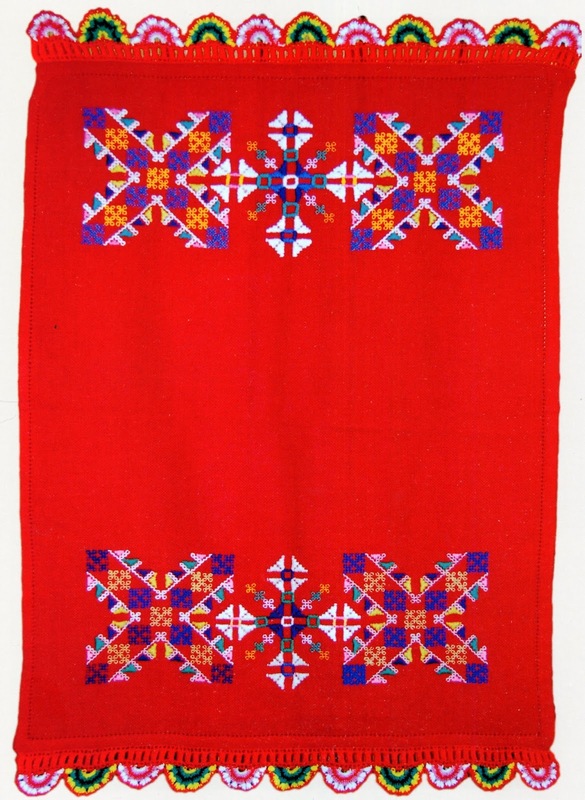 Pay attention to the crochet edges of the red embroidered pieces. 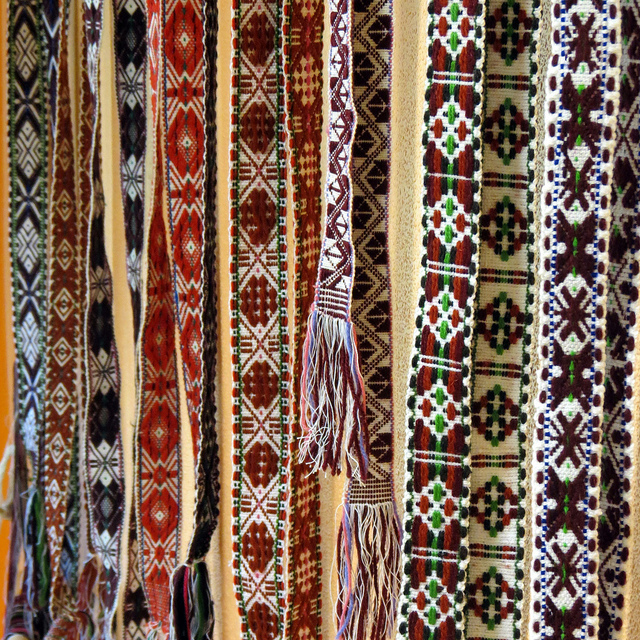 The multi color crochet is also typical for the region. 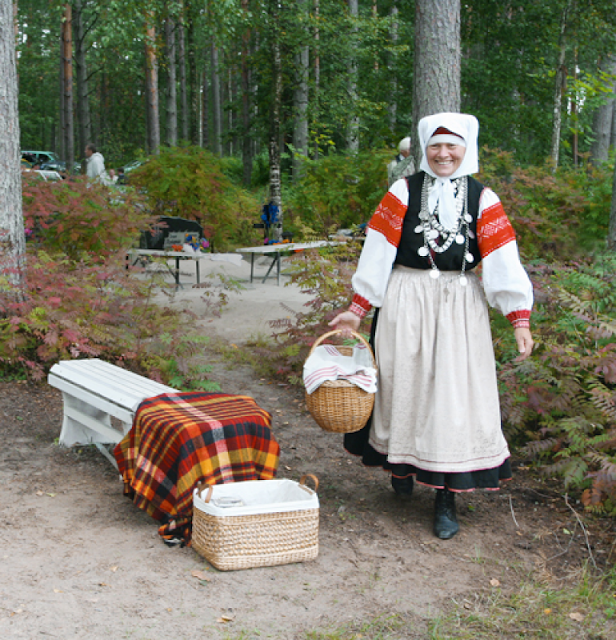 The woman in the last picture is preparing for a traditional family picnic - at the local graveyard! The family meets after church and eat and drink near their beloved ancestors. 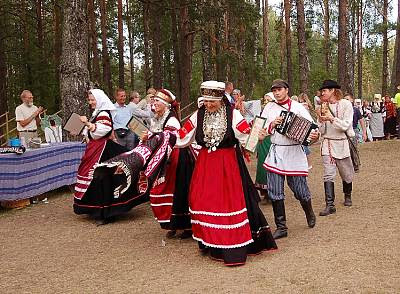 The clergy participates too, a prayer, a song (Eternal memory) and then everybody eats delicious pastries, sandwiches, salt or smoked fish, boiled egs, and different sweets, drink coffee and perhaps a little vodka. They tell stories about and memories of the deceased. The belief is (or was) that everything you eat and drink by the grave is food for the dead. Thank you for this wonderful and informative article! The colors are extra beautiful against the dark green of the trees, and the blue/white of the sky! Thank you for your question. First of all, it is not a breastplate, it is a pin, a brooch, which serves to fasten the front edges of the garment together. This type of pin is very ancient, and is used throughout the Baltic and Fenno-Scandian region. 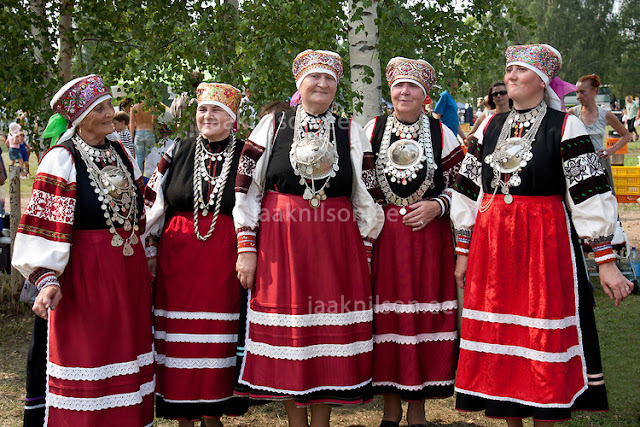 It just so happens that in Setomaa the brooch became greatly enlarged as a vagary of fashion. Similar brooches from the early 19th cent are not quite as large. 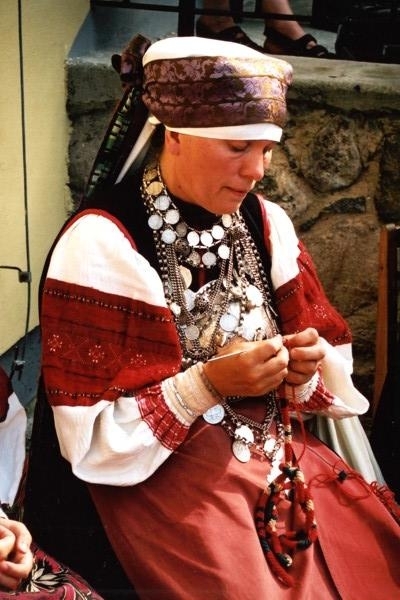 Si;ver jewelry, especially necklaces with hollow silver beads are a very old Finnic tradition, but again the Seto have taken this and gone to an extreme with it [although not as far as some other local traditions, such as la Alberca in Spain] The large brooch is often commented upon, but I have no explanation as to why it occurred in any of my sources. 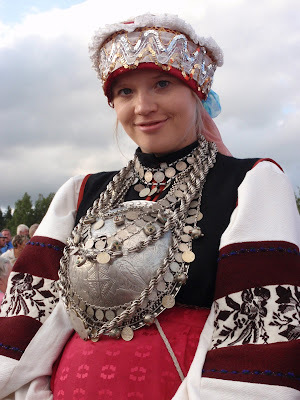 The bigger brooch the wealthier girl/woman. That seems to be the usual explanation. But, like all jewellery they protect its wearer from evil. So in a sense this big brooch really is a shield. I have also read that in olden times bigger brooches were worn by women who were still in their childbearing years.